Photo courtesy of the U.S. Department of Energy. Last week, Governor Phil Murphy announced plans to develop 3.5 gigawatts of wind power off the coast of New Jersey by 2030, joining officials in a number of states, mostly in the east, who have committed to promoting the nascent sector. Murphy’s announcement is the largest commitment of any state so far, and came on the heels of New York Governor Andrew Cuomo’s release of the New York Offshore Wind Master Plan, which details how the Empire State will support 2.4 gigawatts of ocean-based wind by 2030. The offshore wind industry is still in its infancy in the United States, where the first and only offshore wind farm, a 30-megawatt pilot, began operating off the coast of Block Island, Rhode Island in late 2016. Nevertheless, studies have shown that abundant wind resources in U.S. waters offer the potential for large-scale electricity generation. The U.S. Energy Department estimates that offshore wind could produce 2,000 gigawatts of power per year, nearly double the nation’s annual energy use. Breezes that flow along the Atlantic Seaboard are considered to offer some of the most favorable conditions for ocean-based wind generation in the world, but until recently, formidable cost and regulatory barriers have hampered progress here. Now, several massive wind farms are on the verge of moving forward. More than 15 gigawatts of offshore wind generation have been proposed along the east coast, enough to power more than 10 million homes. Nationwide, 24 gigawatts are in various stages of development in federal waters along the east and west coasts of the United States, in the Great Lakes and off the coast of Hawaii. Federal waters begin three miles from shore. 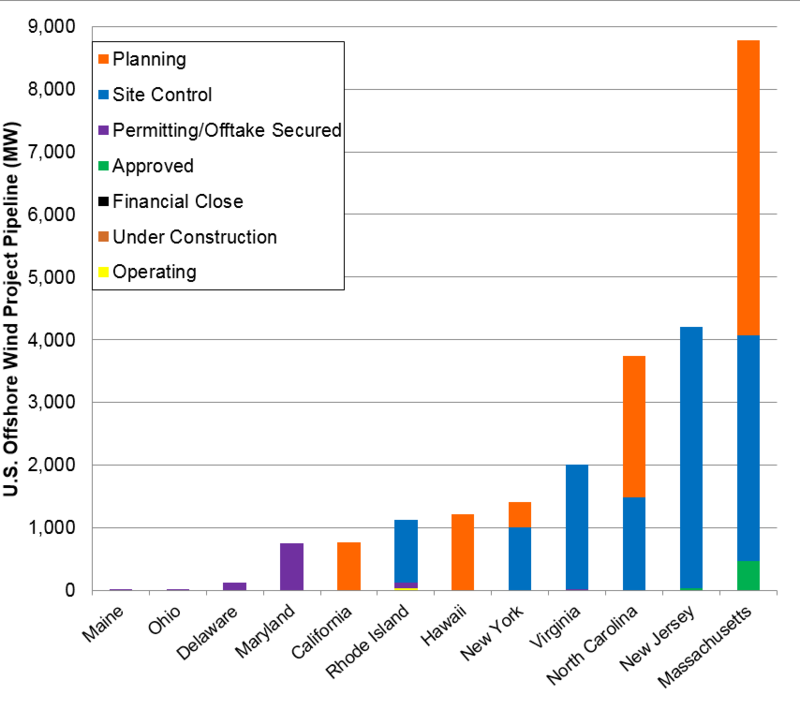 U.S. offshore wind project pipeline by state as of June 2017. Source: U.S. Department of Energy. States that have been promoting offshore wind are hoping that a thriving sector will help them meet multiple public-policy goals, including: fulfilling clean-energy and carbon-reduction targets; procuring zero-carbon replacement power for planned or potential nuclear plant retirements in the coming years; and creating skilled, local jobs. New York, for example has pledged to get half its power from renewable sources by 2030, and reduce its carbon emissions 40 percent by that time. Officials there estimate that offshore wind could be a $6 billion industry by 2030, support 5,000 jobs, power 1.2 million homes and provide an annual $400 million in health benefits from avoided emissions. Other states that are aggressively promoting the sector include Massachusetts, where a 2016 law requires the state’s three investor-owned utilities to procure 1.6 gigawatts of offshore wind by 2027. The Massachusetts Clean Energy Center, a state economic-development agency, has identified eighteen potential waterfront sites that might be available for private investment by the offshore wind industry. In Maryland, regulators last May approved two wind farms for construction at least fourteen miles off the state’s coastline, and as part of the deal, they are requiring that developers invest in a steel-fabrication plant and provide upgrades to a Baltimore port. When completed, the wind farms will have a combined generating capacity of 369 megawatts. 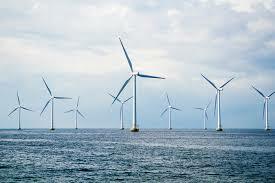 Develop an Offshore Wind Strategic Plan for New Jersey. While the offshore wind industry is in its early stages in the United States, the technology has flourished in European waters, where ocean-based turbines have been generating power for more than two decades. Currently, European countries have more than 15 gigawatts installed, which support 70,000 to 80,000 jobs. This entry was posted in Renewables and tagged offshore wind, renewables. Bookmark the permalink.